Not all the days are same. Today is a little special. Yes.. Its Valentines day. More than me and hubby, the person who was looking forward for the day was Thaara. They had celebration in her school too. The students in her class exchanged cards. Hubby surprised me by getting my favourite chocolates. Very sweet of him. So what I could do to make the day special for them is to cook the food they love. Made Biryani for hubby. Strawberry is Thaara's favourite. 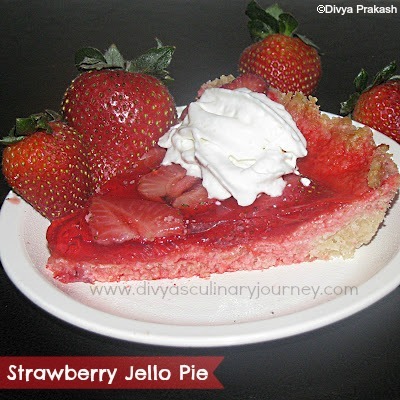 So, for dessert i made this strawberry jello pie. It is very easy to make and its very light. They both loved it. Mix the ingredients required to make the crust.Place dough in the pie pan and spread it evenly with fingers into the bottom and sides of the pan. Preheat oven to 400 F and bake for 15 minutes until the crust is light brown. Wait till the crust cools down. Prepare jello mixture as per the instructions given in the package. Wash and drain the strawberries. Slice them and arrange them in the pie-shell. 7.Serve with whipped cream topping. Special dish for the Special Day, Great.. Chellam! Lucky Mappy!!. Quick and easy.. Very nice Divya. Thanks for linking up dear. Very simple yet perfect for the day!! just found your space...love your space..
nice recipe collection with interesting presentation..